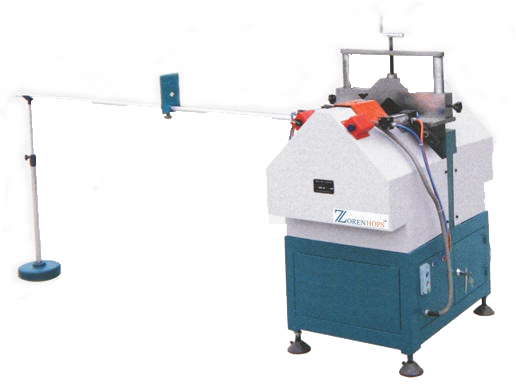 ZHUW-3500.2/2.A colourful uPVC window welding machine is the main equipment for producing uPVC window and doors as it has one left head, one right head, the two heads can assemble one shape finish welding and cleaning. HJ04-3500.3/3.A Three -point welding machine for colorful uPVC door & window This machine is suitable for welding colorful profile film, double color spray etc. HJ04 can clean the entire corner at one time and can control the size of welding seam hence making the corner good-looking and top grade. HJ04 strengthens the hardness of welding through control of the pneumatic system especially during melting to ensure that welding hardness is the best. Also clean the corner after welding. The machine can weld the door and window automatically at in single step after pressing the button. It enables a one step welding for rectangle window frame and can transport the work piece to the next processing. It is high reliability and wide processing machine. It is easy to operate. It is efficient and suitable for batch production. 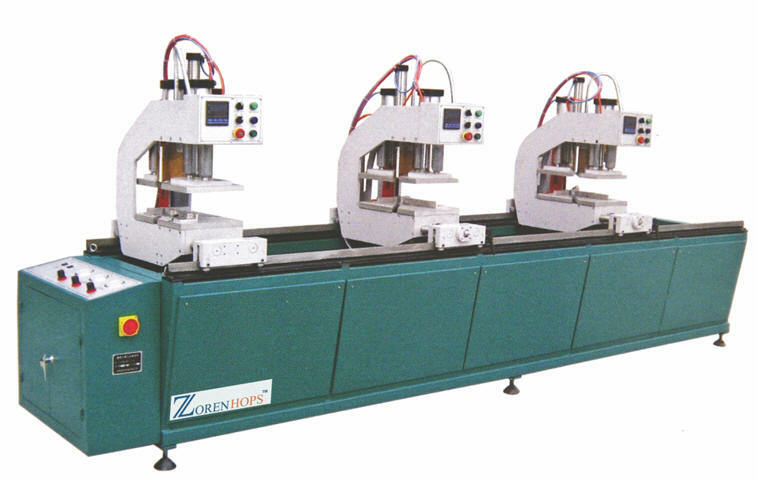 Its four heads can work at the same time and it enables a one step welding for complete rectangle frames and windowpane. Controlled by PLC (Japan OMRON or Japan MITSUBISHI) system, the machine is of high reliability and easy operation and wide processing range. Known for stable running, high positioning accuracy and good welding performance. The machine is suitable for batch production. 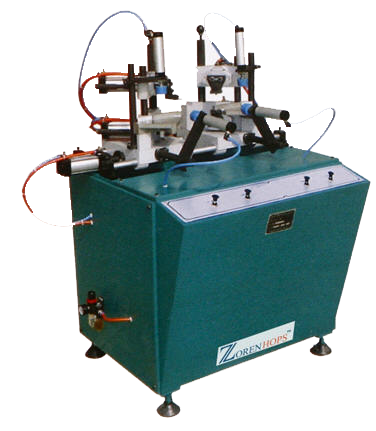 This welding machine is made up of two heads, frame, electric controller box, profile-holding frame, etc. This welding machine adopt good sliding circle guide way and strong frame body. High precision and easy on running. The left head can move 20mm by following the track. Every head has their separate location structure, pressing structure, heating structure and head box. Welding and surface cleaning at same time, economical and time saving. This welding machine is one of the necessary equipment for processing uPVC Window and Door. It can complete the whole welding process alone. It features advanced technique, pneumatic drive, PC control, stable capability and simple operation. The CM non-oil lubricating bearing and liner moving bearing make for high precision and convenient maintenance. The machine has one head that can weld various angles. The two heads can work individually and jointly. Its four heads are controlled by PC system and drives pneumatically. Its movement stand adopts CM no oil lubricating bearing and liner ball bearing. So it is of high precision, easy operation and convenient maintenance. Its four heads can work individually and jointly. 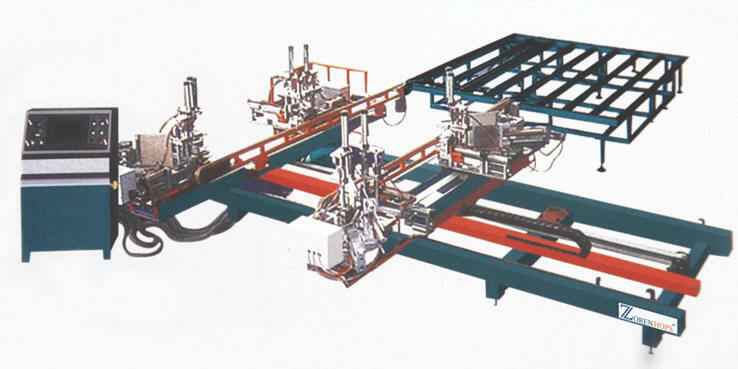 The machine can complete the welding job through organic combination of four heads. One of the heads can weld various angles, which can meet the customers need of welding an Arc and other special shaped windows. 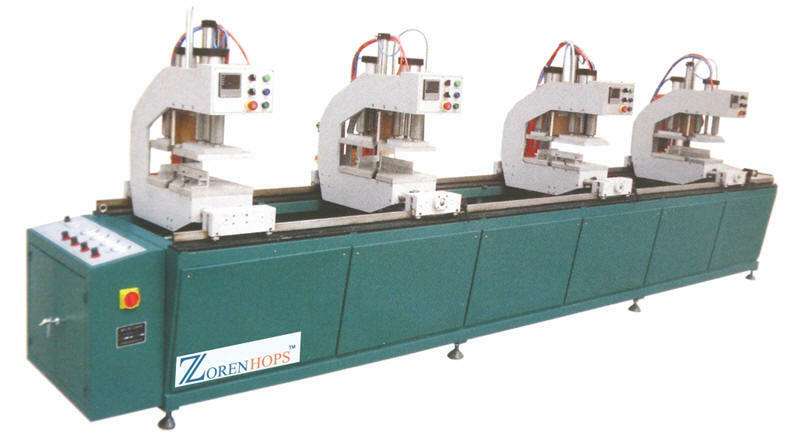 This machine is made up of machine head, machine frame, electric controlling box and supporting shelf etc. There are orientation mechanism, pressing mechanism and heating mechanism etc. 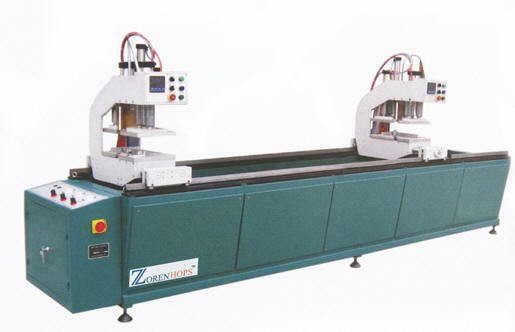 The machine is used for PVC door and window welding processing with variable angle ranging from 30°-180°.It features PC control, pneumatic driving, reliable function, simple operation and convenient maintenance. Used for cutting processing of V shaped groove with angle of 900 for aluminium and uPVC profiles. 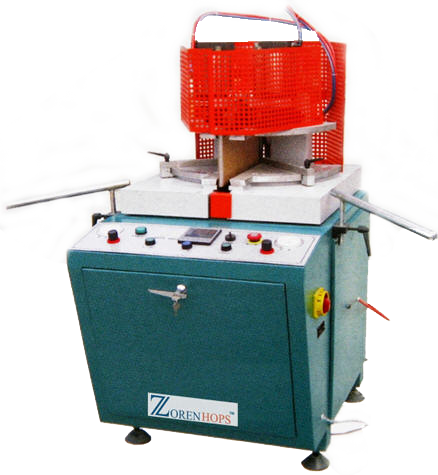 This machine can complete processing procedure of cutting and grooving glazing bead at the same time. With twin working position-locating rulers, which guarantee the precision as cutting and avoid the error, it can measure the window inner frames size. According to the needed size, you can process glazing bead. But as you measure the size directly, you should remove the two rulers from the machine; or you can measure the inner frames sizes at first, and then cut the profile according to the twin working position-locating rulers. Furthermore, there is a tiny adjusting device, with which you can adjust the tightness degree required. 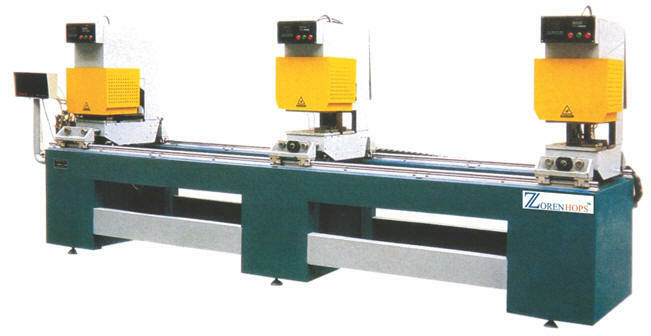 The machine once cut two V-notch mullions with the right angle; it has features of high accuracy and efficiency. 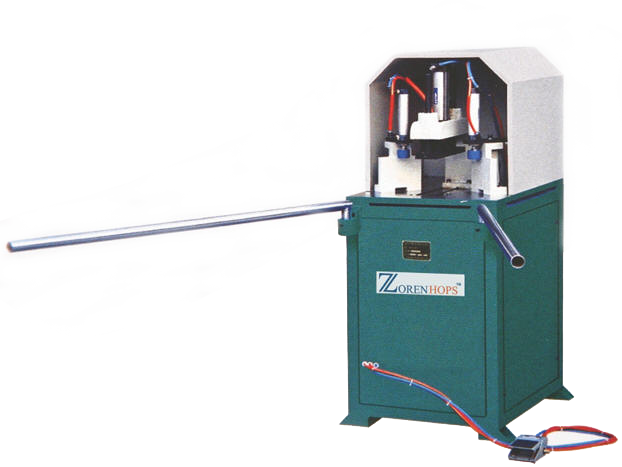 This machine is used for milling of cap-seal profile. Quick and convenient cutter change. Only need to set the locating width when processing different profiles. This machine is made up of the heads, hand-moving elevating mechanism, profile-holding frame worktable, machine framework, pneumatic system and electric system. Adopting the modular design and the whole machine head is one module, which makes installation and maintenance convenient. The machine head adopts pneumatic feeding so that it can automatically finish drilling and horizontal milling at the same time. 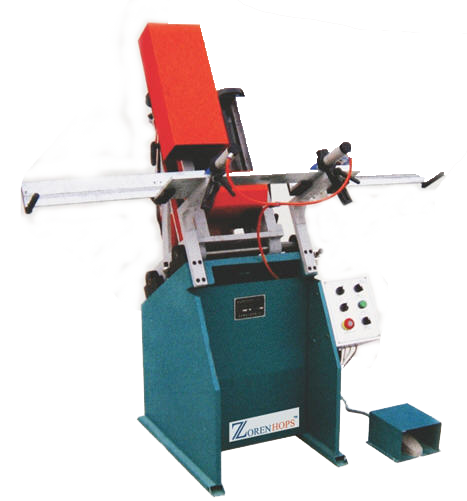 The hand-moving elevating mechanism can realize the adjustment of up and down or back and forth position of the head. It is the special machine for various water slot and air pressure balancing groove processing. The two routing units can be adjusted up and down or back and forth, and the upper unit also can incline within 0°- 45° to meet the processing requirement of different kinds of profiles. One press can realize the same processing in two directions. Mainly used for cleaning angle seam of uPVC windows & Door. It is one set of organic mechanical and electrical equipment, mixing pneumatic mechanical and PC technologies together. The machine can complete the function of vertical milling, saw milling, and cutting. It is of high automation rate, good processing quality and easy for operation. Equipped with American START PC System or Japanese MITSUBISHI PC System, we can setup over 100 groups of programs for processing different profiles. The machine adopts the Numerical Control System, which can set up two-dimension process program according to different profile. The machine can set up and store more than 100 sets of processing program. 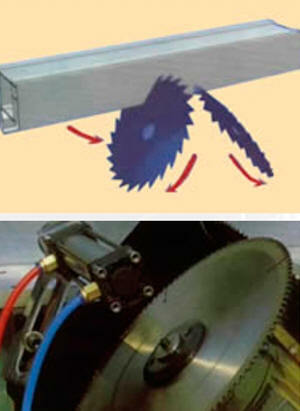 The tray-milling cutter can mill the external corner of uPVC door and window along the two-dimension track. With the upper and the lower vertical cutters, the machine can clean the grooves of airproof bar and the unwanted welding tumor on the internal and the external flat slot at the same time or separately. Simultaneously it can clean the upper and lower flat welding slot with the upper and the lower vertical cutters. Further, the needed number can be keyed in the spot situation, the processing program can be corrected based the spot situation, so welding seam with error can be cleaned up efficiently. 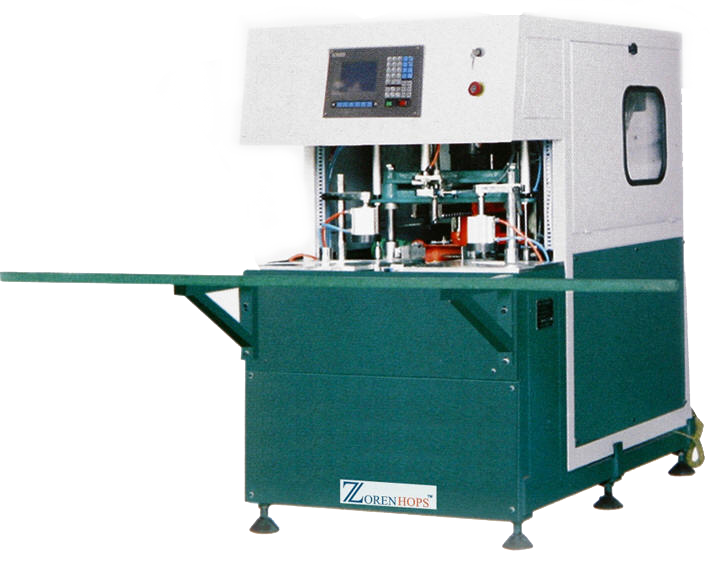 The machine has the character such as convenient adjustment, high automation etc. The machine is a multifunction corner-cleaning machine for uPVC door and window, which centralize numerical control, pneumatic drive, and machinery technology together. It is with high efficiency, multifunction and stable, reliable quality and is the ideal machine for mass batch production of various profiles. 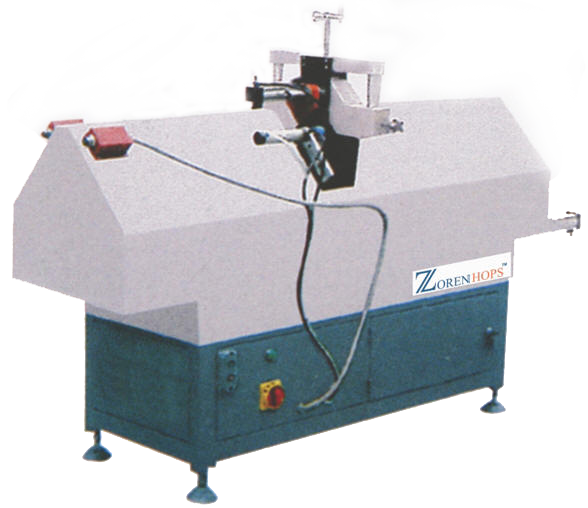 The machine is used for cleaning the up and down surface welding seam after welding of the uPVC door and window at an angle of 900. It is of convenient to operate and is pneumatically driven. 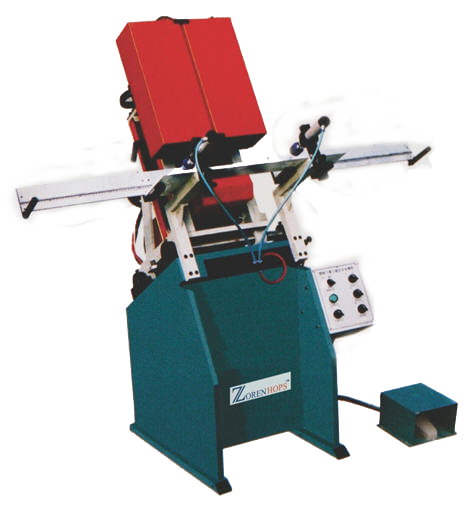 The machine is used for uPVC door & window transom  or shaped welding cleaning work. It features advanced technology, reliable function and easy operation. 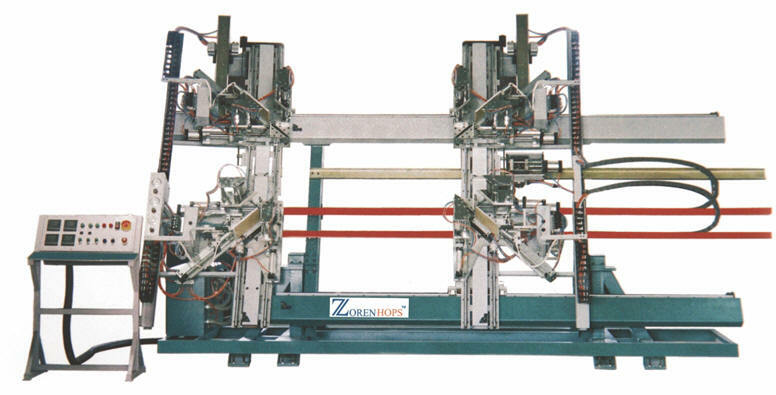 This machine is mainly made up of the machine frame, clamping mechanism, machine head and pneumatic router etc. So the structure is compact. The profile clamping mechanism is made up of the pressing cylinder, swing pole, pressing tool, short pressing pole and the location-restricting pole. It can guarantee the profile is pressed tightly. 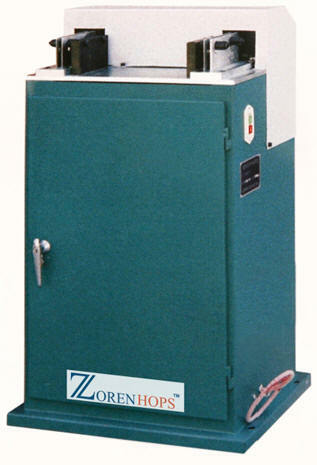 It features pneumatic pressing and pneumatic drive. Only by single clamp adjustment, it can finish the cleaning of the up and down welding seam.